NOT YOUR AVERAGE HALF MARATHONER! HOW SIGNING UP TO DO A HALF MARATHON FOR CHARITY CHANGED MY LIFE! : 2 Months in to training- NO LONGER INSANE! ...This was a 30KM week! PUMPED! 2 Months in to training- NO LONGER INSANE! ...This was a 30KM week! PUMPED! Two Months, Two short months. Two months ago, I went for my first training walk in my quest for the ability to participate on Team Yachad in the Miami Marathon's Half Marathon . My goal was and remains walking the course. Two months ago, I thought I was insane. Late in July, I was so grateful to Yachad for what they gave to Max this summer in the vocational programme at Camp Moshava Ba'ir. He got an amazing work experience and they worked on many things in a work environment that were absolutely amazing and that in fact, took me years to figure out myself once getting into a work environment. One night after taking him out for dinner, I saw the Facebook ad for Team Yachad at the Toronto Marathon on Facebook. I looked it up and every little inch of my gratitude welled up in me and I was blindsided by the urge to sign up. You have to know that what I was looking at were options. Toronto was one option, with a 5k in May, but that did not seem remotely a large enough gesture to reflect my gratitude to Yachad. Yachad has a team at the Denver Marathon but I thought that adding the complexities of training at high altitude was not such a great choice for someone with no long distance walking background. Jerusalem would be an awesome option except, well, getting there was not cheap. Team Yachad Miami would be the most logical one for me. Not inaccessible, and a 13 plus mile walk seemed like a pretty momentous goal for a 45 year old who was nearly 300 lbs and while not sedentary, definitely not in shape. I signed up and then started publicizing the heck out of it. I posted on FB and told everyone I know so that I would have no option to back out. 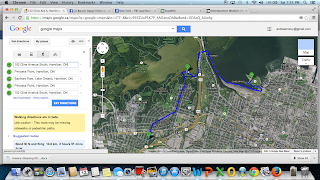 A couple of weeks later, I found someone to get me started walking and we did- it was August 12. I have discovered the beauty of going long enough to get past my muscles warming up and then being able to feel great, even while doing tough trails. I have learned that I much prefer walking with someone else, and audio books are alright but I still prefer a walking partner. I have been able to start seeing differences in my physical condition, including my heart rate slowing faster after a really hard work out and the ability to walk up hills that used to require frequent stoppage to get up. I have learned to enjoy the adrenalin or endorphins or whatever that makes me feel awesome and which, amazingly helps me to keep motivated even after difficult workouts that feel like they are going to kill me while I am going through them. Like Sassafras. I wanted to die doing that trail, but I felt so good after doing it, that WOW when my friend Jeff commented that I should walk that trail until I OWN it, the comment resonated with me. I am thinking that I will probably try to do that trail once a week or so until it seems like no big deal to me. I have learned that the right equipment makes this process a lot easier. I bought a hydration system (which I have not been using so much because for shorter walks, a 1 litre water bottle is enough, but I love the backpack I bought for the hydration system. Mountain Equipment Coop is like my new bestest friend. Wicking fabrics make all the difference to someone who is a total sweater (like sweater or swelterer, not a clothing article) and I also bought Trail shoes because I discovered that I really love walking off road. I am glad I waited to decide what to buy until my actual needs declared themselves. I also bought a garmin watch - a basic one to be able to download my routes and keep track of mileage and such. That being said, thank god for google maps, because in fact, I can usually figure out how far we walked from Maps, for example on Shabbat when I don't use the watch. Shabbat is a great day for me to walk because honestly, we have time and Marc is home and he LOVES walking. Which brings me to the nice side effect of having quality spouse time with Marc. I have never been a walk enjoyer before but he is and he really wished he could have a consistent walking partner. I made it eminently clear that I was not his man. Until now. After so many years, he finally has a fellow walker in the fam. I would say that as long as the weather is remotely decent, we will be heading out on Shabbat most weeks and sometimes we also head out when he gets home from work, although those tend to be shorter walks because it's late. We figure he walks around 4 km a day just getting to and from work, so he is sort of in mild training just by doing that. We actually really hope to do this together! I realize that this whole thing is sort of a metaphor for life in general. I never could have predicted that I was going to enjoy this process. I mean, I heard myself last week saying, that I might actually plan a trip to Jerusalem for the half marathon there a month after florida...I was fearful in the beginning but it turns out that there was really nothing to fear, because I am liking this so much! Sometimes you just have to do it. Get started, get out the door, push through the yucky stuff and once you warm up, find that you are having a completely different experience than you ever thought you would have! Yup, I think that walk today was over 13 kilometres. Can you believe it? Yachad is an amazing organization and I am doing this to raise their profile and raise money!